As it turns out, men can be total gossips. Working among a crew of guys at Back Porch Bakery’s first location in San Luis Obispo, baker Brittney Yracheta could feel her cheeks burn. Whispers and playful jabs centered on frequent visits from Chef Mateo Rogers, then executive chef at The Hatch in Paso Robles. Rogers came for the superior fresh baked bread, but stayed to talk tattoos with Yracheta, and this was happening at least two to three times a week. Were the two foodies becoming an item? Ah, if only those nosey boys at the bakery could have known that a powerful culinary team was brewing right there, among the loaves. 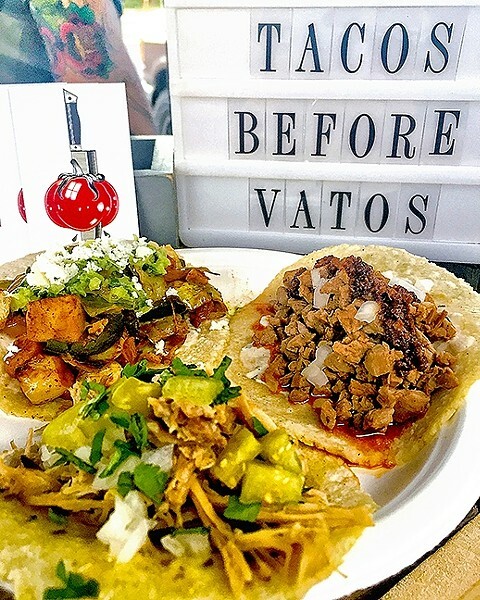 TACOS BEFORE VATOS: Hand-pressed Heirloom Catering corn tortillas caress tender carnitas and local produce picked at peak freshness. Get ’em while they’re hot at Toro Creek Brewing Co. each Tuesday or Tin City Cider on Thursdays and Saturdays. The business took shape in November of 2015, when Rogers left The Hatch to pursue independent dreams. That first “step into the dark,” as Rogers put it, brought forth a major blast of light and positivity. Interest and clientele has boomed, partly because the company is nimble, locally focused, and highly creative. It doesn’t hurt that Rogers, a Hanford native, has worked at fabulous SoCal haunts like Spaghettini Beverly Hills, Fig and Olive, Barton G, and Katsua. Yracheta is a lifelong production baker and French pastry graduate of the Cordon Bleu in Pasadena. “Calling ourselves ‘Heirloom’ offers a sense of something unique and special while also offering a menu that is widely optional and customizable,” Rogers said. Just check out the company’s Instagram account. When you see #locallysourced below a pic, you can be sure it’s no gimmick. Loo Loo Farms and J&R Meats are frequent contributors, and the team is currently on the hunt for a local pig producer to add a dose of porky pleasure to their already beloved regional lineup. Although you can rent Heirloom for your next event, you don’t have to throw a big bash to nosh on what this duo’s cooking. Head out to Toro Creek Brewing Co. Public House in downtown Paso Robles each Tuesday evening for a serious take on the tacos and beer tradition. 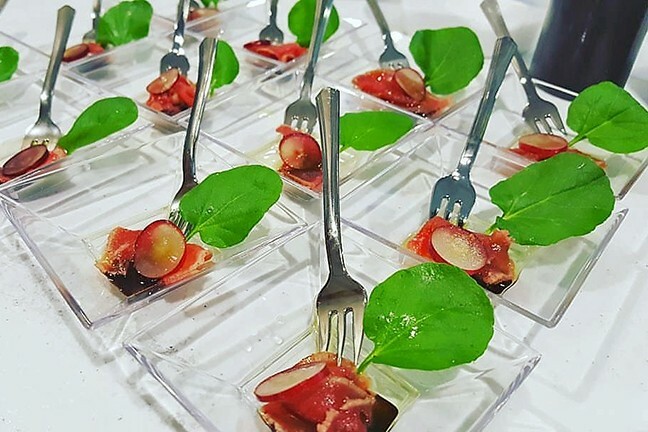 A NEW HEIRLOOM TRADITION: A recent wine pickup party at Alta Colina Winery called for Heirloom Catering’s venison carpaccio with chocolate espresso herb oil, sea salt, and watercress. Say goodbye to crappy crunchy shells and stale ground beef. Fresh, blue corn tortillas are hand pressed, made the Abuela-approved way. Tomatillo salsa is thickened into a sweet, spicy marmalade tinged with a tangy bite of acid. Sauces are fresh and vibrant, topped with ripe-this-moment veggies. The pair has also been known to add their talents to irresistible Chinese Bao buns, Moroccan beef stew served in fresh-made bread bowls, and flakey hot empanadas. Before you paint these two into a corner, it’s not just about traditional Mexican food—oh no. A recent pickup party at Alta Colina Winery in Paso Robles featured pork mole with cilantro lime rice, pork tenderloin, poblano mole, and crème micro cilantro as well as venison carpaccio with chocolate espresso herb oil, sea salt, and watercress. Although both chefs are influenced by their Latin heritage, the real through-line comes down to two things: “local” and “luscious.” If it ain’t those two things, it’s not being served up Heirloom style. AN HEIRLOOM IN THE ROUGH: Find Heirloom Catering at Toro Creek Brewing each Tuesday from 6 to 8 p.m. as well as at Tin City Cider each Saturday and Thursday from noon to 8 p.m. The company will also provide food at the upcoming Paso Robles Wine Festival slated for May 18 to 21 and the Firestone Walker Invitational Beer Festival, coming up June 3. For more information, follow the business on Facebook, on Instagram @heirloomcatering, or email heirloom.catering@gmail.com. “We are not taking shortcuts, not for ourselves or for our clients,” Yracheta said, adding that this means family and friends sometimes stop by to help out with particularly busy events. Although the pair are getting considerably less sleep now, they are incredibly happy, and it shows. Maybe it’s the spring abundance; maybe it’s the love affair they have with their food and each other. If you ask me, it’s probably a mix of all three. Hayley Thomas Cain always has room for one more taco. She can be reached at hthomas@newtimesslo.com.